This is it. 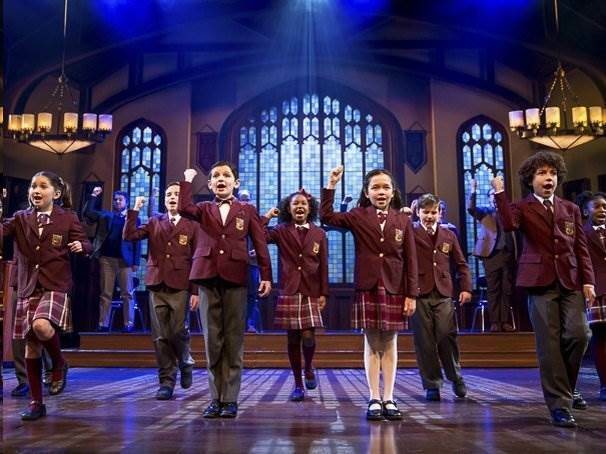 This is that $16 million Broadway show for the whole family, with something for everyone. One caveat: those with sensitive ears, bring your earplugs. This opus is loud. The assumption may be that everyone has seen School of Rock, the 2003 movie, but this supposition is incorrect. 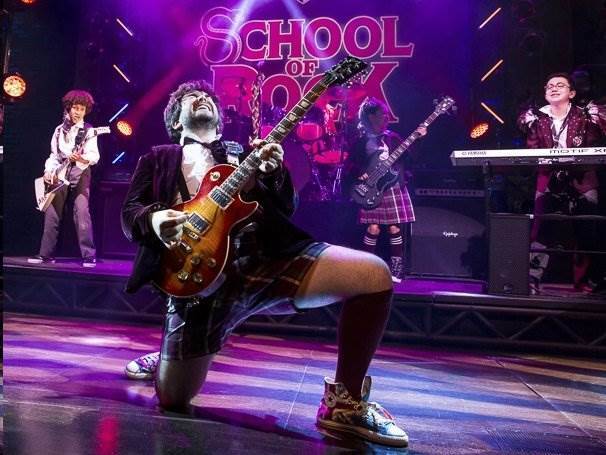 Those who haven’t been exposed to Jack Black in the lead role as Dewey, the loser rocker who gets kicked out of his own band, will appreciate Alex Brightman so much more. While Brightman doesn’t have the same sweetness as Black, he does capture Dewey’s manic energy, and his commitment to his music, his own self-interest, and ultimately, the young musicians he mentors. Dewey is about to get kicked out of his cushy living arrangement. He’s been mooching off former bandmate, Ned (Spencer Moses), for years. The fly in the ointment is Ned’s girlfriend, Patty (a much too pretty Mamie Parris), who’s fed up with Dewey. She wants him out, the sooner the better. When an opportunity arises for Dewey to assume Ned’s identity to make a few bucks, he becomes a substitute teacher at Horace Green, a private school with gifted pupils. Dewey overhears his students playing instruments during a music period, and devises a scheme to form them into a new band; the object is to win the coveted Battle of the Bands. 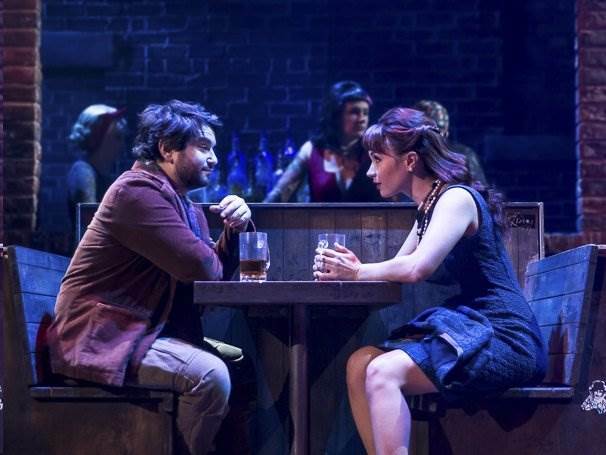 In spite of his worst intentions, Dewey finds himself becoming attached to the kids, and to Miss Mullins (Sierra Boggess), the uptight principal with the heart of a rocker. Dewey is able to bring out her inner Stevie Nicks, clearing the way for the students to escape the prep school and compete in the contest. The pint sized cast members actually do play their own instruments. Their energy level and enthusiasm is through the roof, and it’s impossible to not get caught up in the story of each child. Roles are well defined; the acting is as good as the singing, dancing, and ability to play the various instruments. Interesting to note that while the cast is now more diverse, Summer, the smart bossy girl, is now stereotypically Asian. It is refreshing to see that Tamika has two dads, and Zach and his demanding father are African American. Even Billy, the apparently gay kid who loves to design, now has a father who wants him to love football; of his mother, Billy says “When my mom gets too much botox, I can’t tell if she’s happy.” The back stories add depth. There’s nothing to cause offense in School of Rock. Even the main theme, “Stick It To The Man,” is presented with good humor- and yes, you can buy the T-shirt in the lobby. Andrew Lloyd Webber fans will be glad that he’s back on Broadway after more than a decade, lovers of great voices with appreciate Sierra Boggess, and with or without kids, the audience has a great time. Director Laurence Connor never lets the rhythm falter. 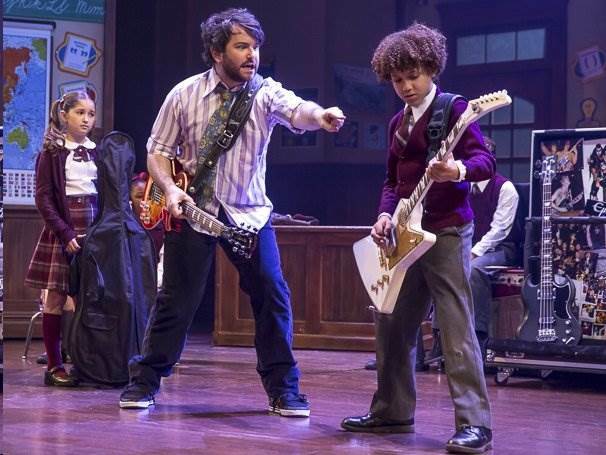 If audience appreciation is any factor, it’s easy to predict a long, healthy, and really loud future for School Of Rock.